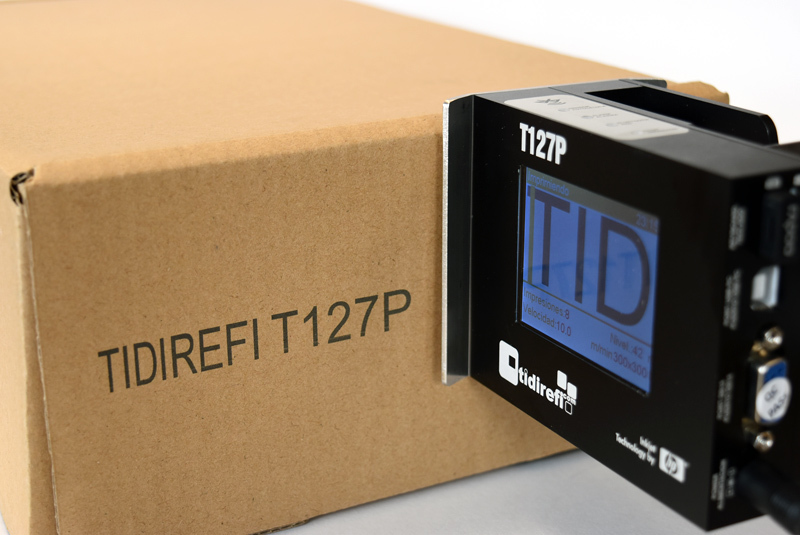 T127P printer is probably the most simple industrial inkjet printer in the market. It has been designed to fulfill the needs of a wide range of inkjet applications, both simple and complex. Combining its easy usage with a good performance, avoiding high production costs, it is an excellent investment. Its intelligent design and hit-prevention system printhead, allow an error-free coding even in an hostile environment. As opposed to other inkjet printing system, this one does not require calibration procedures nor replacing pieces. The printer has a colour screen, based on a graphic system, a clear menu and it has the possibility to visualise messages. All this characteristics make the printer very easy to use. It does not require a PC to work with it, as it has an excellent software design and a keyboard with Bluetooth conectivity, using smartphone or tablet with IOS or Android, allowing you to access to information of a variable database. You can print up to 6 lines of text, logo, symbol, barcode and different size font, from 1,69 mm to 12.7 mm height and with a maximum speed of 228m/min. T127P printer uses cartridges which are very easy to replace, and fast-drying inks which guarantee an optimal adhesion on porous and non-porous surfaces, depending on the type of ink selected. Thanks to the cartridge smart chip, it detects the type of ink and sincronize work parameters, so this way the printer permits an autocalibration which avoids error. The printer permits to consult the cartridge ink level, reduce the cost of marking and calculate how many messages can be printed with the message design you edit. The bulk ink system of 442 ml permits to reduce cartrige replacement, increase running times and minimizing intervention in the printer. It has been specifically designed for high printing volumes.